We thanks a lot the Chinese organisation for the production of this very interesting video as well as for the actractive final report, which are a good remembrance for all whom attended the Congress, and shows to everybody the many events and activities on this wonderful occasion. The duration of the video is about 20 minutes. Depending on the connection speed, it could take several seconds before the video starts. The weight of the report is about 40 mega. It took over 100 years to Intersteno for deciding to have its second Congress outside Europe, since the first was in Chicago in 1893 and was attended by nearly 500 participants mainly from United States. This Congress in China was possible thanks to the big efforts mainly done by Mr Tank Keliang with Mr Liao Qing and the support of Ms Wei Xia, together with a huge Adviser Committee. The venue of the Congress, differently from all ones visited in June 2008 by an Intersteno delegation including Ms Sante, Mr Devriendt and Mr Trivulzio, was the Olympics Sports Center for the opening and closing ceremony as well as the computers’ competitions. 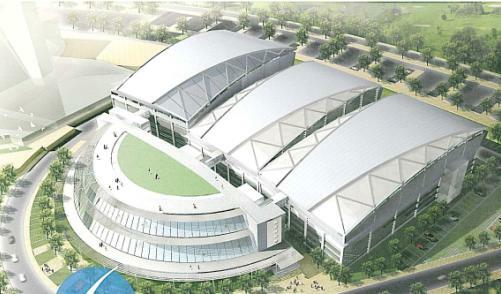 All other events and accomodations of many groups were done at the nearby Olympics Sports Center Hotel. Over 800 persons crowded the huge hall of the Olympic Stadium Centre for the opening ceremony on August 15th, among whom there were many Chinese teachers and students. 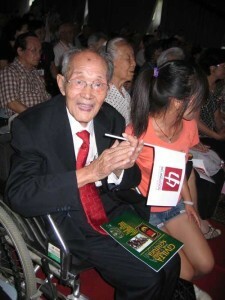 The official start of the Congress was done my the Father of the Chinese shorthand, Mr Tang Yawei, 93 years old, who invented his system in 1938 and conceived the electronic version which is proficiently used in China, thanks also to the education plans put into effect in the last 10 years. The ceremony was decorated by many performances, which were much appreciated by the international attendans. At the end a welcome drink consented socialisation with old an new friends, with tons of photos with everybody. After the fun, the work: with uncredible efficiency and timing a task force installed the nearly 200 tables needed for the computers’ competition, to be held the following morning. All competition texts are freely available on this web site, as well as the classifications lists which are splittend by age category and technology ((when deemed useful for a better evaluation of results). Many young people participated in this event which was not only devoted to the visit of important monuments of Beijing but also to appreciation of the interesting moments of the Chinese life under the guidance of their friends. Taking part in the preparation of traditional Chinese cooking was a very exciting moment for them. Comments on this event were all positive, notwithstanding the tireness at the end of the long visit. On the day devoted to youth, all other participants had the opportunity of taking part in a guided tour to the People’s Palace which is the heart of the Government of this immense country. 12 Speakers presented their reports on many topics covering various aspects and strategical opportunities. A meeting of IPRS (Intersteno Parliamentary reporters session) was arranged to which other contributions about the evolution in the reporting fields were shown. Chaired by Mr Tang Keliang an International meeting on Education was also held. You can use this link for the full list and abstracts, as well as to read the complete reports and related files. On August 21st the Prize awarding ceremony took place again in the big hall of the Olympic Sports Centre, and it was exciting and memorable for the very good results. At the end the emotional moment: Mr Tang Keliang put into effect his idea to released the Intersteno flag to the organizer of the next Congress in Paris 2011, Ms Jacqueline Bertin-Maheiux and Mr Jean-Charles Le Masson. The flag will be then moved from country to country in the following venues. A very nice dinner was served afterwards: a big final for a very big Congress, people are now friends and they dance with any kind of music. Beijing permitted to producers of China and Korea to show their latest developments, together with colleagues of other countries. Stenotype was not able to be present due to last minute problems of Mr. Wenclasky who was always attending our meetings. For French language an important and expert newcomer came in, Stenomedia. Visit to China by the Intersteno Jury President, Secretary-treasurer and President for discussing about the planning and venues of the Congress. They had the opportunity to have friendly meetings about many issues, visit possible venus, and luch with Mr Tang Yawei, at his home. 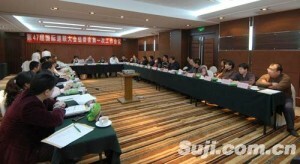 An International Shorthand Talent Development Summit Forum in Tianjin (the 3rd city of China) was arranged. Speeches were subtitled with Sulu technology. You can read a report on this visit in our e-news 29 and see aphoto reportage at this link. The first global meeting of the Organizing commitee took place in Beijing. It was attended by the representatives of many entities and associations which supported this important event; appointments of duties where done for the various activities. OTHER MEMBERS: Directors of stenography training centres. The terminal typing speed of Yawei Chinese steno-machine is 520characters/min, normal typing speed in daily work is 240character/min. It solved two difficult problems: fast input of Chinese character and computerize the Chinese shorthand. This make the shorthand in our country span the historical step of mechanize period and come into computerize period and connect to the worldwide steno. Yawei steno has become the symbol of Chinese steno. It contains scientific research, manufacturing, education, application, employment of learner and so on. It become a new fresh trade, and start a new age of Chinese steno. In 1996, it was put in the Item of National Torch Plan. In 2000, it gained the National Patent Certificate. In 2005, it win the Beijing science and technique First class. In 2006, it win the science and technique First class of Qian Weichang Chinese imformation dealing, this is the highest awards in the area of Chinese information dealing. In 2007, it win the second class of National technich invention. Yawei steno have gained recognition of Communist Party and departmental government. 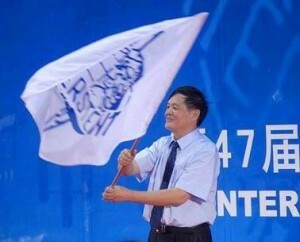 The information centre of National People Representative Conference adopt Yawei techniques. It has 10 professional stenographer; and the Ministry of Foreign Affairs has set up a group of stenographer, they are serving for the leader of country and for important activities; the 17th conference of Communist Party, news presentation,hearing of witmesses of State Department and some local government conference all adopt Yawei techniques to realize realtime record. In 1997, the Highest Demotic Court announce that widely use Yawei Chinese steno-machine in court system, in order to realize court judge record computerize. By now, there are nearly 3,000 courts have used Yawei Chinese steno-machine, it makes court judge morden and make the group of clerk more professional. In order to fit this developing the Highest Demotic Court decided administrate the clerks separately. Now the making of captions in TV, internet and broadcast; interview of the news all adopt Yawei technique. It makes the speed of spreading faster and create new form of spread media, eg: live telecast on internet. Many all-around hub and professional hub adopt Yawei steno technique to make live telecast. In 2003, Labor Department and Social Security Department have published the standard of professional stenographers. It made stenographers more professional and create the service of realtime recording basic on Yawei steno technique. From then on the professional stenographer and professional company of conference service were born. They are charged with all the conference service of realtime recording, and become a new group in conference and exhibition economy. Shorthand is one of the most important functions that a secretary must master. Many companies have new requirement of secretary. In application, we’ll find that a secretary who master Yawei steno technique is usually praised by the companies. In our country there are 200 professional training organizations and 200 junior and senior colleges have the courses of Yawei steno. Except Macao,Qinghai it is a mass of all over the country, every year we’ll train more than 10,000 students. Chinese higher education association, Chinese vocational education association and Chinese vocational education league such education research organizations are all consider that the person who master Yawei steno technique can fit the requirement of social informationization. Yawei steno open up a new way for obtain employment, it should be spread widely in more higher colleges. Stenograph is very proud of their 70 year tradition, which has evolved into being the world-wide leader in creating a searchable text record of the spoken word. The foundation of our solutions is built on our rich history of manufacturing a family of shorthand machines anchored by the élan Mira and Stentura Fusion. Theories and unique keyboard configurations have been developed to meet the needs of the many languages used world-wide. The core to efficiently creating transcripts of the spoken word is the world-leading software Case Catalyst. In all the corners of the world, and in many different languages, Case CATalyst has been very effective and flexible. Combining voice recognition software with Case CATalyst we have produced an extremely effective tool Case CATalyst VP for voice writers. Other ancillary products, such as the Broadcast Captioning Suite BCS, has given captioners world-wide a tool to subtitle live television or other major events. Stenograph is proud to continue its involvement and sponsorship of the InterSteno Conference. Please visit our booth while in Beijing. Born from the association of a stenotypist and two world renown specialists in linguistic engineering, StenoMedia is highly skilled to develop your CAT software.Because every language is specific, we know that no one can apply to all. StenoMedia will develop your own CAT software based on the most advanced language models available in your language of interest. STENTOR, the smart software: the Convergence of Stenotypy, Computer Science and Linguistic Engineeging. Whatever your language, StenoMedia offers you a solution. Access to Stentor Club for exchange among usersFor ease of use, also available to Mac users, a first in the CAT world ! Last update of this page 15th August 2011 by gpt.